The Earth's oceans and the water that once flowed on Mars likely came from a similar source: meteorites that landed on the planets when they were first forming, new research suggests. Scientists analyzed the makeup of two rare Mars rocks that crashed into Earth as meteorites, and found that Martian water probably came from planetary building blocks similar to those that formed Earth. The two planets likely formed in parallel ways, but then took divergent evolutionary paths. This finding goes against the common idea that the water in terrestrial planets like Earth and Mars came from comets. Instead, scientists think it originated in chondritic meteorites, which contain small, granular minerals that become integrated into the planets they land on. 'These meteorites contain trapped basaltic liquids, not unlike the basalts that erupt on Hawaii," John Jones, an experimental petrologist at NASA's Johnson Space Center in Houston, said in a statement. "They are pristine samples that have sampled various Martian volatile element environments." Jones was a co-author on a paper detailing the findings published in the journal Earth and Planetary Science Letters. The research was led by Tomohiro Usui, a former postdoctoral researcher at NASA's Lunar and Planetary Institute in Houston. The two Martian meteorites studied represent two very different sources of ancient water from the Red Planet, the researchers found. 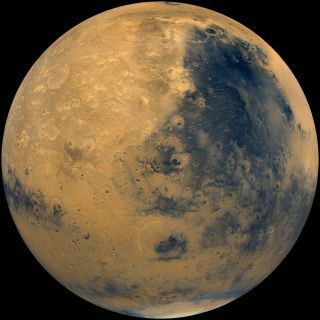 One space rock came from a middle layer of Mars called the mantle, with traces of water from the deep interior of the planet and about the same amount of a special type of hydrogen found on Earth. The other meteorite is enriched with material from the shallow Martian crust and atmosphere. The meteorite from the mantle suggests Mars' interior is dry. Meanwhile, the enriched meteorite has 10 times more water, indicating the surface of Mars might have been very wet at one time. "There are competing theories that account for the diverse compositions of Martian meteorites," Usui said. "Until this study there was no direct evidence that primitive Martian lavas contained material from the surface of Mars."